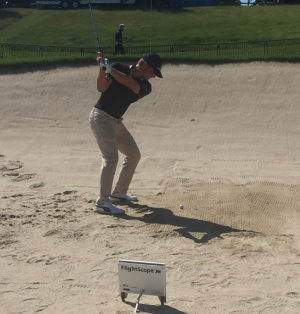 Congratulations to Bryson DeChambeau for winning the DAP Championship and earning his 2016-17 PGA Tour card!Bryson has been a long time user of FlightScope and was first introduced to the technology by his coach Mike Schy of the Mike Schy Golf Performance Institute. The FlightScope team is privileged enough to be given the opportunity to guide Bryson behind the scenes and on various tournament ranges to help him achieve optimal numbers.Using FlightScope during practice, Bryson looks at Vertical Swing Plane (VSP), Club Path and Face Angle as a starting point to get his swing dialed in. Bryson has one of the highest VSP's on tour with his irons. FlightScope believes that is one of the main reasons that he is such a consistent ball striker. Another FlightScope feature that is used by Bryson and his team is the Speed and Acceleration Profiles. These profiles allow Bryson to understand what shafts perform the best and are most consistent, which is especially useful with a driver.Bryson is now the 15th player in Web.com Tour history to win in his first start and the youngest winner on the Web.com Tour this season. Well deserved!